What a difference a summer makes. Only last June the Evening Standard’s front page lauded that Britain’s support for continued membership of the European Union was the highest ever. 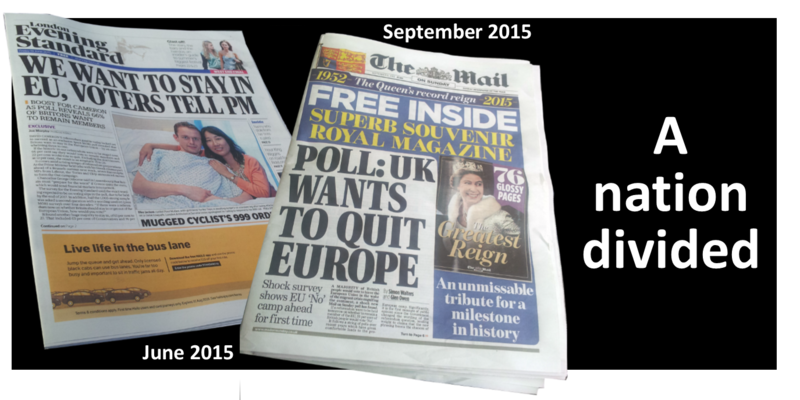 Yesterday, the Mail on Sunday’s front page turned that around, with a poll showing that for the first time most British people want to quit the EU. The Mail cited the ‘migrant crisis engulfing the continent’ as a major reason for Britain’s change of direction on the contentious EU in/out issue. According to this latest poll, if a referendum was to be held tomorrow on whether Britain should remain a member of the EU, 51% of people would vote, ‘No’. It means that the nation is pretty much split down the middle. Not ‘one nation’ as the new Conservative government promised the country, but clearly two nations almost exactly evenly divided on whether Britain’s future should be in the European Union or not. In last June’s poll by Ipso Mori, 75% of British people were in favour of Britain’s continued membership of the EU, with only 25% wanting to leave. The poll meant that support for the EU was at its highest at the beginning of the summer since the European Community was renamed the European Union in 1993. Now, as the summer draws to a close, it’s the turn of pro-EU campaigners to feel alarmed. In the latest poll, by pollsters Survation, the gap between those who want to stay in the EU and those who want to leave has dramatically narrowed from 75/25 in favour to 51/49 against. The poll also revealed that if the “current migration crisis gets worse”, 22% in the ‘Yes’ to European camp might switch sides. But following advice from the UK’s Electoral Commission, the referendum question is now going to be amended to, “Should the United Kingdom remain a member of the European Union or leave the European Union?” It means that instead of a ‘Yes’ or ‘No’ answer, voters will be asked to answer ‘remain’ or ‘leave’. The Survation poll was the first one which gauged the public’s opinion in response to the new referendum question. It’s thought likely that the referendum will be held this time next year, and since the mood of the nation has changed so dramatically over the summer, it might yet change again in the space of twelve months. So both the ‘remain’ and ‘leave’ campaigners have all to play for. It’s likely to be one of the most hotly contested political campaigns in living memory. Leaving the European Union is a right of every member; no country was forced to join the European Union and all members are free to leave. The rules of leaving are set out in the Treaty of European Union Article 50. If Britain does decide to leave the European Union, it will be the first time that a member state will have left, although in 1975 Greenland left by default when it won independence from Community member Denmark. In a subsequent referendum, Greenland voted against membership. Britain’s departure wouldn’t happen overnight as there would be a period of ‘exit’ negotiations which could take up to two years, although commentators believe that there would be many more years of uncertainty on a wide range of issues. For example, what would be the status of EU migrants living in Britain and British migrants living across the EU? There have been plenty of suggestions, but nobody yet can know for sure because negotiations to leave haven’t taken place. Also, Britain’s trade agreements that are currently ‘legislated through the European Union would have to be individually re-negotiated with each of the world’s countries. Regarding ‘free trade’ that Britain currently enjoys with the rest of the EU, in theory that would be lost upon leaving the EU and we may be back to customs duties and import/export tariffs. UK Prime Minister, David Cameron, is currently negotiating with other EU heads of states to agree changes to Britain’s membership of the EU, including a proposal to curtail ‘free movement of people’, a core tenet of the EU that gives all EU citizens the right to live, work, study or retire in any other EU or EEA state. Today the Mail reported that relations between Mr Cameron and Chancellor of Germany, Angela Merkel, were not exactly getting closer. According to a new book being serialised by the paper, ‘Cameron at 10’ by Anthony Seldon and Peter Snowdon, Merkel accused Cameron at a private dinner at 10 Downing Street of being ‘too forceful’ in demanding concessions from the rest of the EU. With probably a year to go before the referendum, both the ‘remain’ and ‘leave’ campaigns are limbering up for a blistering, all-out fight. 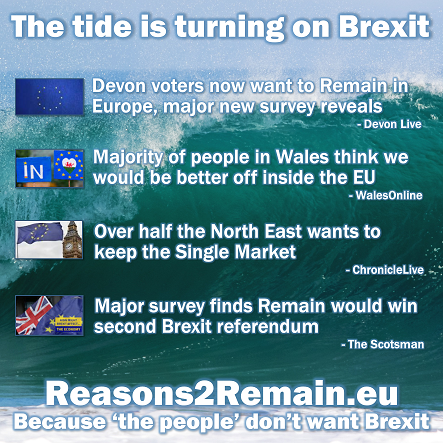 The referendum is likely to be the defining moment for all those allowed to vote – which will not include most citizens here from the rest of the EU, but will include citizens with leave-to-remain in the UK from Britain’s ex colonies. The outcome of the referendum will affect the country’s future for decades or maybe hundreds of years to come. Unless something dramatically occurs to change my mind by the day of the referendum, I will be voting for Britain to ‘remain’ in the European Union. But I do think it’s important that both sides of the argument are carefully listened to. The issue is too important for anybody to answer the question, “should we stay or should we go?” without careful consideration of all the implications. 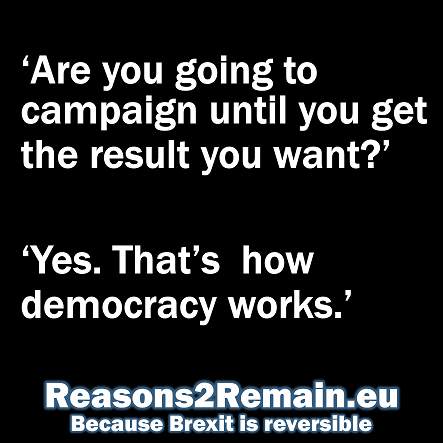 The referendum – who can and can’t vote? 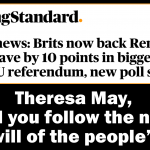 This entry was posted in Current Affairs, Economics & Trade, Global & International, Media & Communications, The EU and tagged evening standard, Mail on Sunday, referendum, survation. Bookmark the permalink. Previous: Why is Britain so against migration?